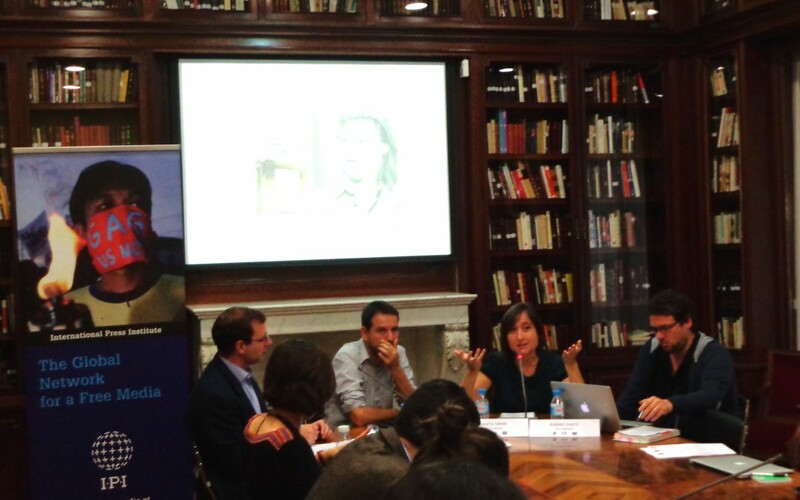 Cafè amb llet co-editor Marta Sibina discusses her experience having been targeted in a defamation lawsuit during an IPI seminar on defamation laws in Madrid on Nov. 28, 2014. Joining her are El Agitador editor Carlos Meca (L) and fellow Cafè amb llet co-editor Albano Dante (R). Photo: IPI. MADRID, Dec 15, 2014 – Among the many guest speakers at IPI’s recent seminar on the abuse of defamation laws in Spain were three journalists working for independent media outlets who shared their experience of being subjected to legal action following their reports on corruption. Hailing from the Spanish island of Lanzarote, the satirical blog El Agitador has been sentenced to pay a total of approximately €38,000 after losing two court cases – one criminal and one civil – related to vignettes considered to have offended the honour of a former public prosecutor implicated in a municipal corruption affair. The images referred in particular to the prosecutor’s occupancy of a home determined by local authorities to be in violation of various rural housing regulations. In the criminal case, a judge condemned the blog in 2013 to pay a criminal fine of €8,000, plus €15,000 in damages and legal costs to the prosecutor. In June 2014, a civil court similarly ordered El Agitador to compensate the prosecutor €15,000 for moral harm. The cases stemmed from two separate vignettes, published in 2008 and 2011, respectively. Speaking to IPI following the recent seminar’s group discussion, Carlos Meca, El Agitador’s editor, said his initial reaction to the lawsuits was one of disbelief. With the help of a pro bono lawyer, the magazine has appealed both rulings. The criminal appeal is currently pending before the Spanish Constitutional Court, while a regional appeals court is considering the civil case. Joining Meca at the seminar were Alberto Dante and Marta Sibina, editors of a free Catalan-language monthly magazine, Cafè amb llet. In 2011, Dante and Sibina were ordered to pay €10,000 in damages to Josep Maria Via, a businessman involved in the Catalan healthcare industry and an advisor to the regional government. The case stemmed from a video – “The Biggest Robbery in the History of Catalonia” – in which Cafè amb llet’s editors criticised what they viewed as a lack of transparency in Catalonia’s publicly funded healthcare system. Dante explained to IPI in an interview that he and Sibina had taken the decision to publish the video after finding themselves at a “dead end” in terms of accessing information related to their investigative reporting on the management of Catalonian public hospitals. The video, he said, “changed the focus to put the fact of not having information at the centre of the discourse … but not in the sense of stopping to talk about healthcare to talk about the difficulty of obtaining information, but rather how that difficulty translates into how the healthcare system functions”. Dante and Sibina said their days following the news of Via’s lawsuit were marked by “defencelessness and loneliness”. Although Cafè amb llet boasts a self-reported circulation of 142,000, its owners say they had few resources to counter the claim. Like El Agitador, Cafè amb llet benefited from pro bono legal services, if only by chance. Dante explained that they had read about a lawyer who had been involved in the 15-M, or indignados, protests spurred by the Spanish economic crisis. Contacted by Dante and Sibina over the Internet, the lawyer agreed to take their case, despite not being an expert in media law. The judge’s argument in ruling against the magazine was that the statements made in the video amounted to unproven – and thus libellous – accusations of wrongdoing. Dante said the decision left not only him and Sibina, but also legal experts who reviewed the case afterward, “perplexed”. Similarly unconvinced was the Barcelona Appeals Court, which in February 2014 reversed the ruling, stating that the video amounted only to “sharp criticism” and constituted a contribution to democratic debate. The ruling permitted the magazine to re-upload the video after the lower court had ordered its removal. The editors of both publications indicated that the support they received from other journalists and media outlets was essential, yet ultimately limited. In terms of the national level, Meca noted that an article published by the Spanish daily El País in August 2014 helped generate some interest in the case in mainland Spain. Other humorous publications, such as Mongolia, did their part by dedicating vignettes to El Agitador’s plight or by helping to secure interviews. But at the end of the day, Meca said, support for the blog was confined to just “a few disparate media”. But Dante said that many journalists, not unlike himself and Sibina, were burdened by a “great lack of knowledge about fighting these things.” Moreover, he added, large media outlets that had remained silent about the topics that the magazine had been investigating also kept quiet when it came to the legal action. Dante told IPI that the knowledge that critical voices can be vulnerable to the abuse of defamation laws had led him to take certain precautions in, for example, the type of language employed. But, he reflected, “something tells you to take care that [such precautions] don’t lead you to silence yourself.” Hesitation in the manner of expression, he noted, may prevent a journalist from informing readers clearly. Perhaps having in mind Spain’s recent social movements, Dante compared his situation to that of protesters who accept the risk of being targeted with tear gas. Journalists must strive for honesty, professionalism and rigour, he emphasised. But in situations where protection cannot be guaranteed, “there comes a point when … you have to accept the risks and cross your fingers”. Such, Dante suggested, was the duty of the profession.